Meditation is a way of transforming the mind. 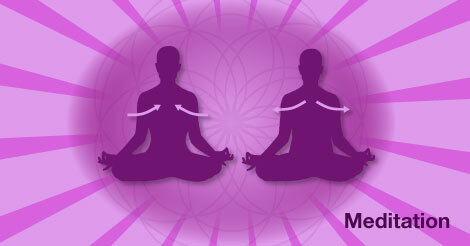 Meditation allows a person to control their thoughts, and promotes positive energy. All of us seek peace and harmony, because a lot of us find a lack of this in our lives. We all want to be happy. Happiness is a goal we strive towards more often than attaining it. At times we all experience dissatisfaction in life–agitation, irritation, disharmony and suffering. Our personal dissatisfaction remain limited to ourselves and yet we keep sharing our suffering with others. The atmosphere around each unhappy person becomes charged with agitation. In this way, individual tensions combine to create the tensions of society. The basic problem of life is its unsatisfactory nature. Things that we do not want, happen, and things that we want, do not happen. Twenty five centuries ago in Northern India, a man decided to investigate the problem of human suffering. After years of searching and trying various methods, he discovered a way to gain insight into the reality of his own nature and to experience true freedom from suffering. Having reached the highest goal of liberation, of release from misery and conflict, he devoted the rest of his life to helping others do as he had done, showing them the way to liberate themselves. This person was Siddhartha Gautama, known as the Buddha, or the enlightened one. Buddhist meditation practices helps to develop concentration and emotional positivity. Meditation can be used to combat stress, depression. Buddha did not teach any religion or philosophy or system of belief. He called his teaching “Dharma”, that is “Law”, the law of nature, experienced and verified by oneself. Therefore, in his teaching Buddha always gave highest importance to the direct experience of truth. What he had experienced, he explained as clearly as possible so that the others might have guidelines with which to work towards their own realization of truth. The only way to experience truth directly is to look within, to observe oneself. All our lives we have been accustomed to look outward. We have always been interested in what is happening outside, what others are doing. We never try to examine ourselves, our own mental and physical structure, our own actions, our own reality. Therefore we remain unknown to ourselves. We do not realize how harmful this ignorance is. Meditation makes one feel relax and calm. Meditation gives peace of mind. Meditation is the key to healthy life.